Before I plunge in, let me thank Mac Wyckoff for sharing his research. I also want to share with you his conclusion about the evidence he has presented on the Kirkland story. 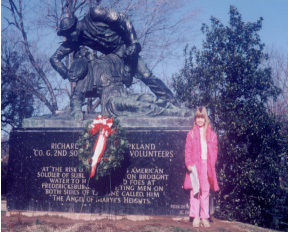 Mac's daughter Melinda in front of the Kirkland memorial on the 125th anniversary of the battle, in 1987. There is no question that cases like Kirkland present the NPS or any caretaker of history with an immense challenge. When a story or a place becomes a cultural icon–told and retold, interpreted and reinterpreted–it’s easy to lose track of what we really know and what we don’t know. It’s also easy to lose the distinction between the story itself and how that story has been used. We have dealt with recent examples of this in this forum: the auction block in downtown Fredericksburg and Stonewall Jackson’s arm. But neither of those have the charged aura that surrounds Richard Kirkland. His is a case study that embodies evidence, memory, and the practice of public history (in this case, by an agency of the federal government). William Ludwell Sheppard's image of Kirkland at Fredericksburg. Many would follow. Let’s start with the evidence. Some have postulated (see Michael Schaffner’s thoughtful post over at Civil War Memory) that the Kirkland story may have had its origins in a conscious post-war attempt to forge a specific and favorable view of the Confederate soldier and the war at large, i.e. the story is not the product of history and fact, but rather may be the product of memory–“the cultural, social, and political milieu of South Carolina in 1880.” In light of that, what do we REALLY know, and what can we reasonably conclude? – We know that within six weeks of the battle, Walt Whitman recorded being told by a wounded Union soldier that as he lay between the lines, “several of the rebels, soldiers and others, came to him at one time and other” and that one “middle-aged man” moved about the field, “among the dead and wounded for benevolent purposes.” It is not clear if this particular Samaritan was a soldier or one of the “others” mentioned by Whitman. 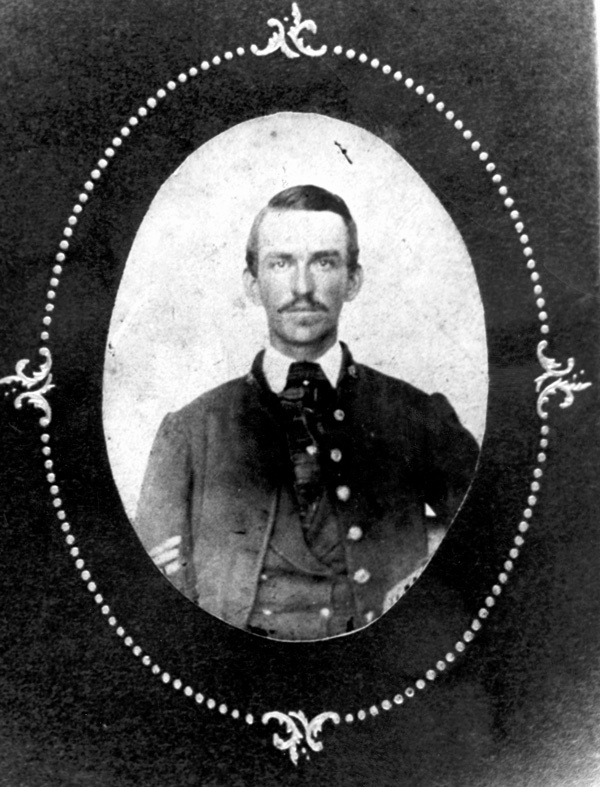 – We know that before his death in 1870, James Hagood wrote specifically of a soldier from Kershaw’s brigade going over the wall to assist Union wounded. – We know that in the decades after Kershaw identified Kirkland, at least five members of the 2d South Carolina stepped forward to retell the story, by implication endorsing if not confirming it. – We can’t say that any of the Samaritans described by either Whitman or Hagood was Kirkland. – We cannot say whether those who stepped forward after Kershaw’s 1880 account were reinforcing or simply restating Kershaw’s account. With one exception—the story of Isaac Rentz, written by a friend in 1919—the post-Kershaw accounts offer few additional, distinguishing details that would allow us to speculate that the writer witnessed the event rather than simply read about it at Kershaw’s hands. – Though apparently prompted to record his (Kershaw’s) memories by a newspaper editor, Carlyle McKinley, who became known for his romantic, sentimental portrayals of the South (thank you Robert Mosher, a reader, for adding this to the record), we can’t document (beyond speculating) that or why Kershaw might have fabricated his story about Kirkland. 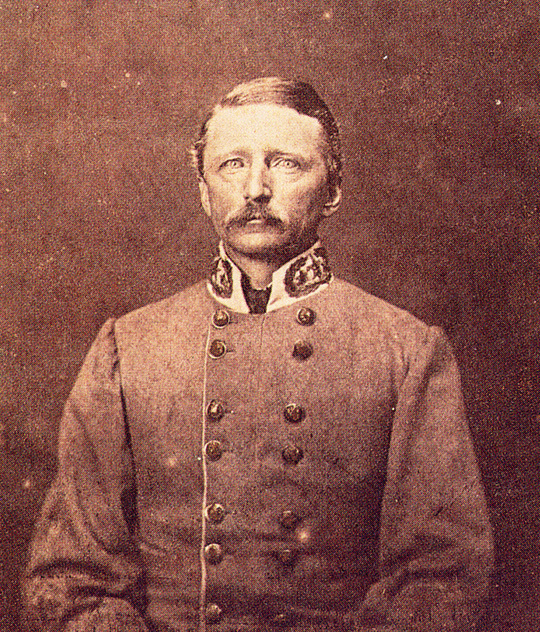 In the years after Kershaw came forward with his story, several members of the 2nd South Carolina–in speeches and in writing–confirmed (or perhaps echoed) Kershaw’s story without adding any substantial details. Among those telling essentially the same story as Kershaw was Captain William Zack Leitner of the Camden Volunteers, Kirkland’s original company (click here and here to see his accounts). Another member of the Camden Volunteers told the Kirkland story, writing under the pen name of “Veteran.” William Terry Shumate and his brother Robert Young Hayne Shumate of the Butler Guards (Co. B) both wrote about the incident. Thomas M. Rembert of the Camden Volunteers and William Dunlap Trantham of the Flat Rock Guards, a close friend of Kirkland, also wrote about of Kirkland’s deed, though both had transferred to other units and were not present with the 2nd South Carolina at Fredericksburg. Edward Porter Alexander, the well-known artillerist and observer of the Battle of Fredericksburg, wrote about the incident two years after Kershaw. There is also a post-war account by a member of the 16th New York that clearly and simply re-states Kershaw’s original account. But there are two memoirs that post-date Kershaw’s account that do add details to the story. Most interesting is that of an unidentified member of the 2d South Carolina who in 1919 wrote a tribute to his friend Isaac Rentz of the Brooks Guards. It’s short and worth reading–click here. Aerial view of the Sunken Road area, with key sites and the extent of the Union advance indicated. 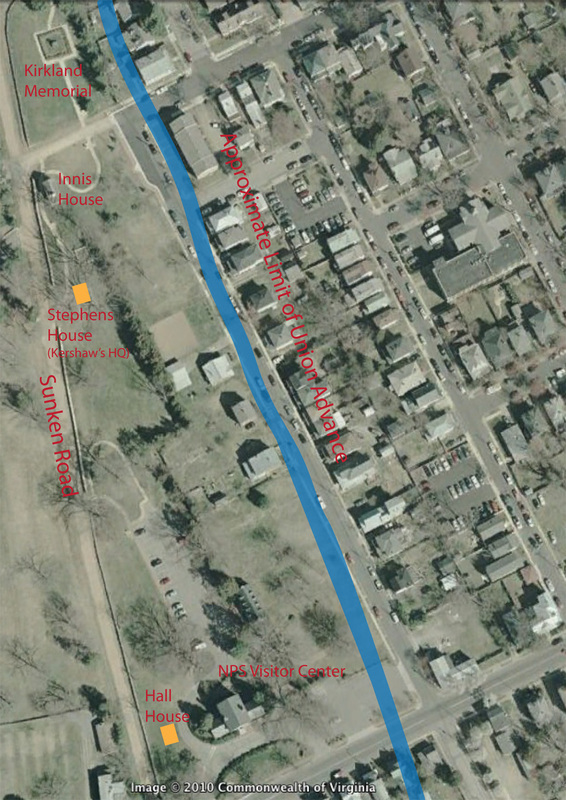 While a few Union wounded likely lay between the limit of advance and the Sunken Road, most would have been located to the right of the blue line on the map. We cannot say how far Kirkland or any other samaritans might have ventured. Map by Hennessy. Click to enlarge. But from an evidentiary and historiographical standpoint, something else stands out. In conveying the story, the writer could not recall which battle served as the setting for this event. Had he simply reflected back the Kirkland tale as told by Kershaw and others, that detail would likely have been forefront in his narrative. But it was not, which suggests an independence from other accounts that, perhaps, accords this telling of the story more significance than others. Another post-Kershaw account adds an additional detail. R.N. McKinley of the 18th Mississippi Barksdale’s Brigade adds that the Yankees on the field cheered Kirkland. 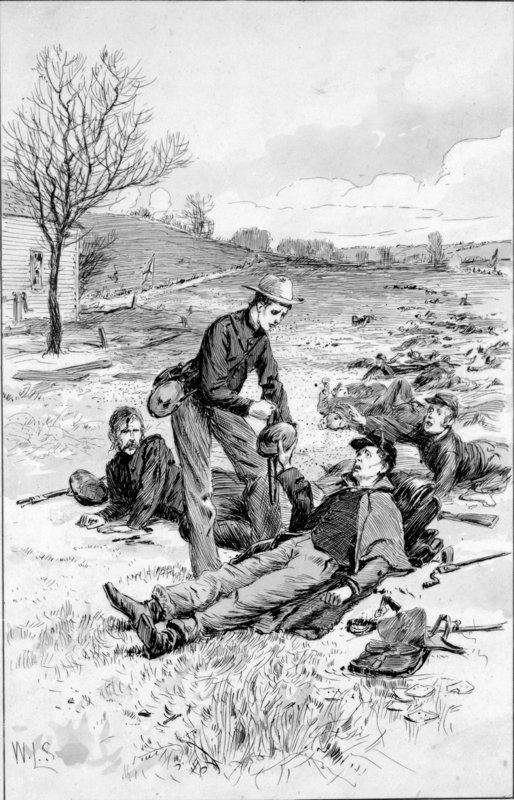 It was in this battle that Sergeant Kirkland asked permission of General Kershaw to let him fill his canteen with water and take it to the wounded Yankees in our front, who lay all night and that day calling for water. The General consented but told him he would do it as his own risk. When the Yankees saw what he was endeavoring to do, all fighting ceased and they gave him a royal Hu-Yah. There’s no question that the many post-Kershaw accounts, with the exception of the Rentz story, don’t seem to add much to the historical record. They may help confirm Kershaw’s account, or they may simply reflect it. But there are two sources that may be more important than all of these–two sources that pre-date Kershaw’s 1880 description by a full decade. Perhaps the most significant reference to what may have been Kirkland comes from South Carolina Colonel James Robert Hagood of the 1st South Carolina. Read Part 2 of this series of posts here. 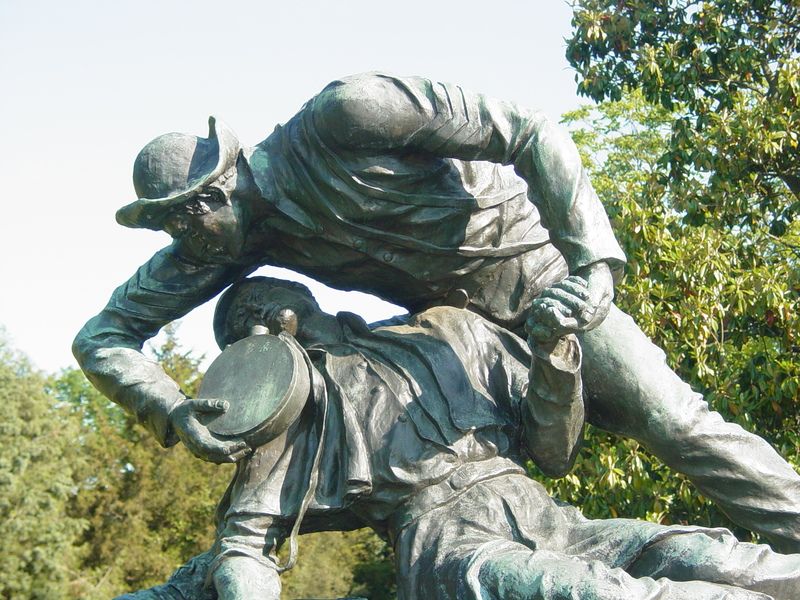 On December 14, 1862, the day after the bloody Union assaults on Marye’s Heights at Fredericksburg, Sergeant Richard Rowland Kirkland of the 2nd South Carolina risked his life by giving humanitarian aid to the wounded Union soldiers in front of the heights. It’s a world-famous story, commemorated by an impressive statue by Felix de Weldon, who also created the statue for the Iwo Jima Memorial. The Kirkland story as we know it had its origins in two accounts published in early 1880. The most famous (but, as we will see, not the first) was written by former Confederate General Joseph B. Kershaw, who commanded the brigade in which Richard Kirkland’s 2d South Carolina served. I strongly suggest you read the account in full, which you can find here (as published in the New York Times on February 10, 1880)..
– Kirkland was not promoted to lieutenant for gallantry at Gettysburg—he remained a sergeant until his death at Chickamauga. – He was not in Company D, but originally in Company E (the Camden Volunteers), with an 1862 transfer to Company G, the Flat Rock Guards. 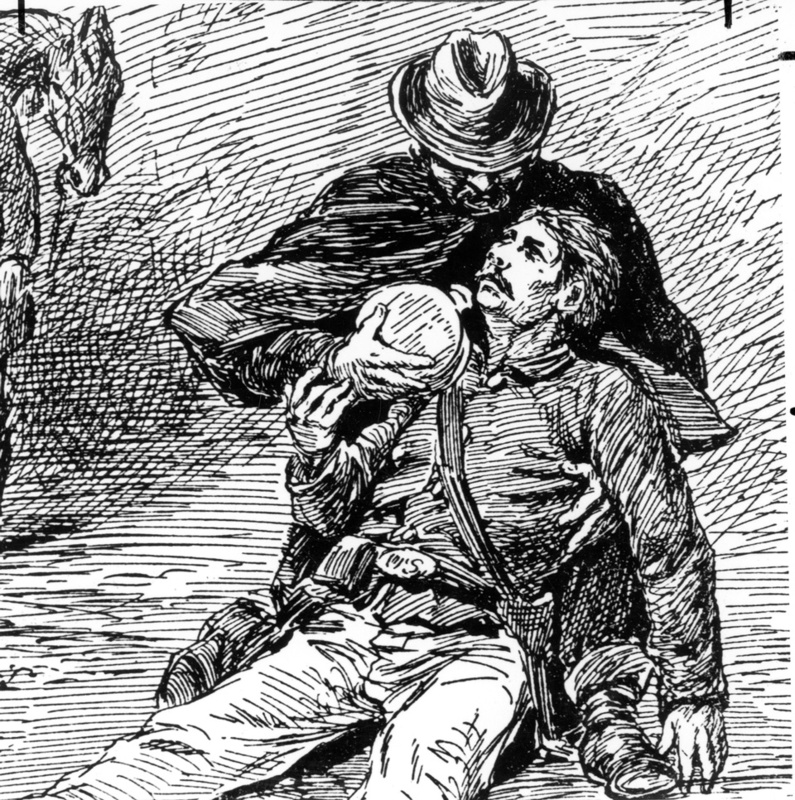 – It’s unlikely Kirkland jumped the stone wall to get to the Union wounded. As shown in the photo below, there is a break in the wall in front of the Stevens House. After gathering water from the well (on the right of the picture), Kirkland probably just walked through the Stephens’s yard to the open plain beyond. – It seems unlikely that after seventeen years Kershaw could have recalled the exact words used in his conversation with Kirkland. The Stevens house. The well likely used by Kirkland is on the extreme right edge of the image. Note the break in the wall. But these are insignificant points. Most of Kershaw’s account seems reasonable. Still, I must admit that at times in my early research of the 2nd South Carolina that I lacked confidence in the veracity of the story. Parts 1 and 2 (found here and here) looked at the reconstruction of earthworks, for interpretive purposes, at FRSP in the 1930s. The reconstructions were located at the Chancellorsville, Wilderness, and Spotsylvania Court House battlefields. Such reconstructions ultimately require a good deal of maintenance. It does not take long for the elements to cause cave-ins, sloughing of dirt and the decomposition of the logs. At some point, either by decision or neglect, the reconstructed earthworks began to dissolve into the landscape. Only one stretch of reconstructed trench was targeted for renewed attention. This occurred in 1977 at the section of reconstructed trench directly behind the “Bloody Angle” on the Spotsylvania Court House Battlefield. The paperwork associated with the proposed rehabilitation (or reconstruction of the reconstruction) states that by 1977, the “logs, and earthworks have deteriorated due to the forces of nature, resulting in a shallow embankment devoid of log works.” The plan called for re-establishing the interpretive works and providing a defined pedestrian trail from the Bloody Angle to the reconstructed trench. The work was accomplished the following year. There is no evidence that any of the other trenches received such attention. In the 30 years that have passed since the most recent reconstruction, the trenches behind the Bloody Angle once again show the need for attention. In the late 1990s, FRSP decided to add more reconstructed trenches to the landscape. 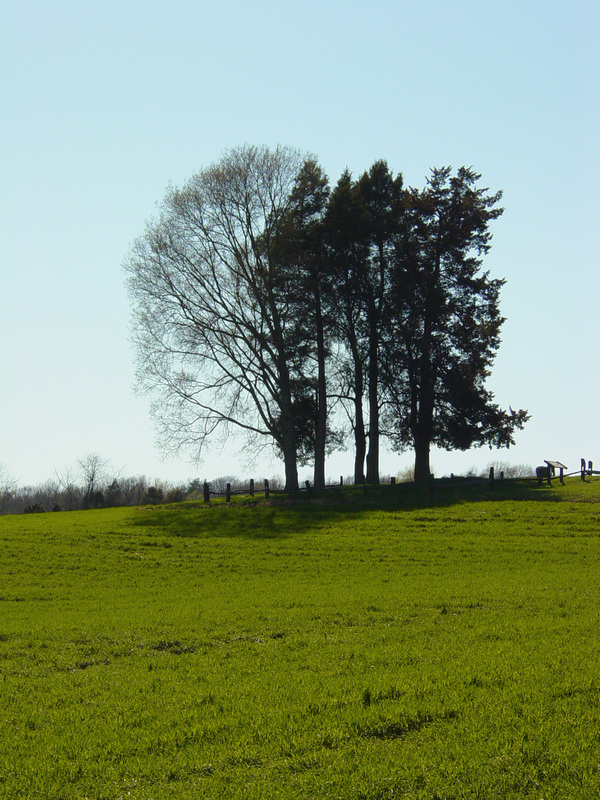 These interpretive works were built at the terminus of Anderson Drive on the Spotsylvania Court House Battlefield. Unlike the 1930s reconstructions, no original trenches were excavated or harmed in the process. The construction of Anderson Drive in the 1930s, as a park tour road, had already obliterated roughly 20 feet of Confederate trenches along what is known as Lee’s Last Line. That section of Anderson Drive that connected with Brock Road was removed in the 1980s, thereby reducing through traffic and turning the drive into a strictly interior tour road. This location for the reconstruction of trenches was chosen because of the disturbed nature of the ground and the ability to juxtapose the interpretive works with the adjacent remnants of the original trench line. In the ten years since its construction, it too is beginning to show the signs of deterioration. During the two decades after the NPS acquired Ellwood (in 1977), Jackson’s arm gained status as a roadside curiosity, identified in a growing number of guidebooks and, eventually, online sources. 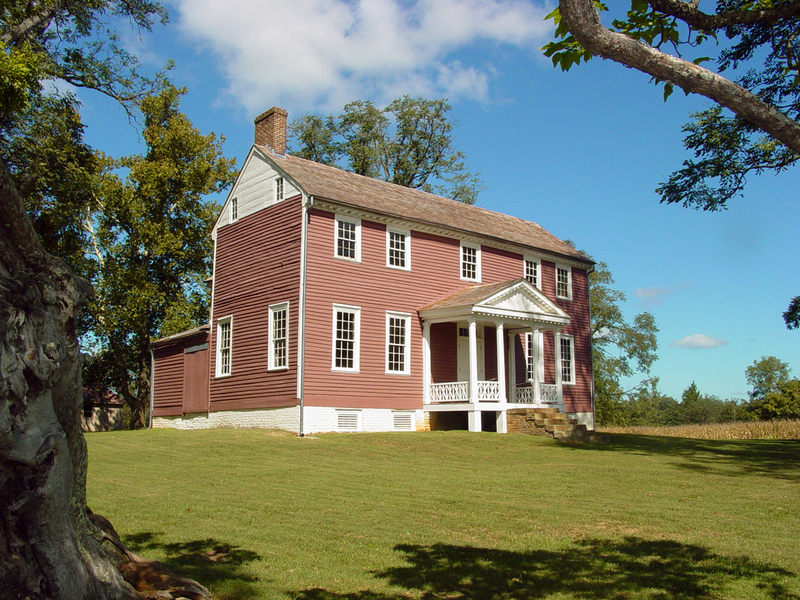 When in 1998 the NPS, in conjunction with the Friends of Wilderness Battlefield, announced that Ellwood would be open to the public for the first time, the press latched on not to the idea of the house and its powerful history, but to the oddity of Jackson’s arm. Fearing looters–and cognizant of the surreptitious night-time visit to the cemetery described in Confederates in the Attic (and the possibility it could inspire imitators or worse)–the NPS decided to protect the presumed gravesite. The plan was to locate the burial and then pour a concrete apron atop it as a permanent barrier to vandals seeking the ultimate Civil War artifact (what someone might have done with Jackson’s arm afterwards is anyone’s guess, but some thieves don’t think that far ahead). Given the entrenched wisdom that Butler had reburied the arm in a metal box, we presumed locating it would be an easy matter accomplished with a magnatometer and little digging. No metal box. Which in turn led to an archeological excavation by increments that no one thought would be needed. Careful investigation of the area revealed no evidence that there had ever been a grave shaft dug near the monument–the clay subsoil nearby was undisturbed–or if one had been dug, it was very shallow. The archeologist found just a few artifacts from the war period in a narrow disturbed layer. Ellwood, the wartime home of J. Horace Lacy, the brother of Jackson's chaplain Beverly Tucker Lacy. During the work, which spanned two days about three weeks apart, apparently a visitor happened along, inquired, and was told that nothing had been found. This apparently, is the nugget of news that morphed into the internet rumor that emerged a few years later: that the NPS had dug up the arm and secretly stashed it away. When this suggestion came across my desk in 2004, we decided to lay everything we knew on the table and reassess the entire arm story. These posts derive from that effort (though they have been enhanced greatly by Eric Mink’s subsequent research). 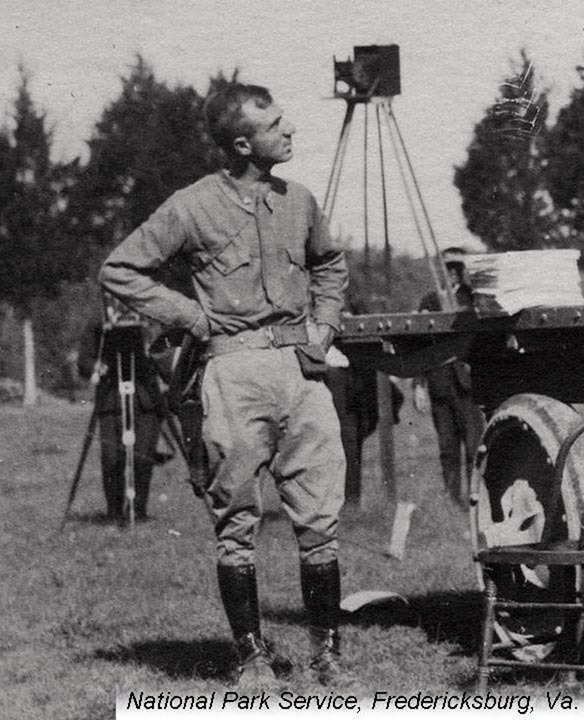 In 1903, James Power Smith, one of Jackson’s staff officers, directed the placement of ten markers in the Fredericksburg region–most of them associated with Jackson or Lee. One of these commemorates the burial of Jackson’s arm at Ellwood. Of all the people on earth in 1903, probably none were more qualified to know and mark the site of Jackson’s arm than Smith. He had been with Jackson the night of May 2, 1863. He was married to Agnes Lacy, J. Horace Lacy’s daughter, who had grown up at Ellwood (she was Beverly Tucker Lacy’s niece). 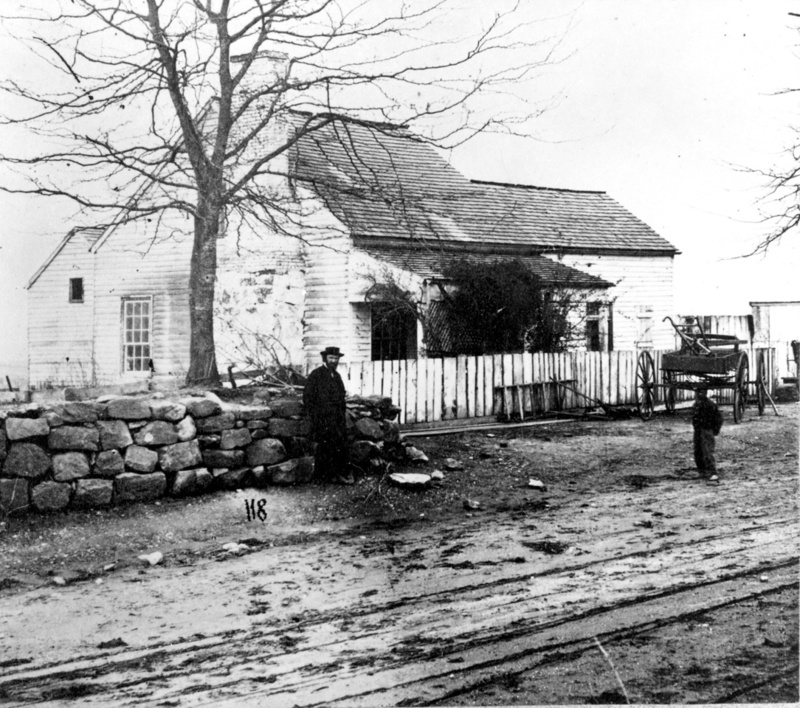 After the war Smith assumed the pastorship of the Presbyterian Church in Fredericksburg, which during the war had been (in an unofficial sort of way) Tucker Lacy’s church. From 1887 until his death in 1900, Rev. Lacy lived in Washington DC, though physically disabled, still bright of mind; Smith surely had regular contact with him. The point is, Smith had access to more knowledge about Jackson, his arm, and its fate than anyone alive. But we know little of the knowledge that guided Smith in the placement of the stone that “marks” the grave of Jackson’s arm. We know there was no marker at the site when Brainerd visited on May 7, 1864. We don’t know if Smith knew the specific location from conversations with B.T. Lacy, or from family tradition, or if indeed someone had placed another marker after the war. Indeed, we have no idea if Smith even intended to mark the specific place of burial, if he knew it at all. We do know that others of his markers were knowingly approximate. Perhaps he intended his stone to be purely commemorative rather than a grave marker. Or perhaps he intentionally put the stone away from the grave itself, to avoid future desecrations like that carried out by Union soldiers in 1864. Regardless, over time the stone was presumed not just to commemorate the burial, but to mark it specifically. Still, we can’ be certain of that. 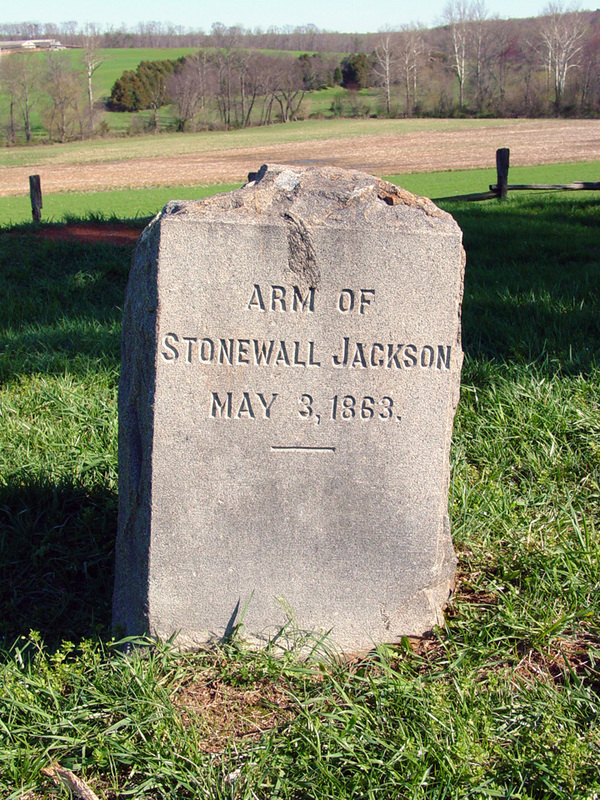 Few body parts in history have received as much attention or inquiry as Stonewall Jackson’s arm (a Google search on “Stonewall Jackson’s arm” returns 43,000 listings). The arm, buried in the Jones-Lacy family cemetery at Ellwood, has for decades been the object of theories and rumors–some of them curious, like one several years ago that claimed the NPS had secretly disinterred Jackson’s arm and put it into museum storage (the NPS did not). When confronted with that theory, we were inspired to take a hard look at exactly what we do know about Stonewall Jackson’s arm. We’ll share the results of that work here in a three-part post. The first will convey what we know about the arm and its meanderings during the Civil War; the second will untangle what we know about it since 1865, including a purported effort to dig it up in 1921 and the 1998 archeology at the site intended to locate the burial so it could be protected. 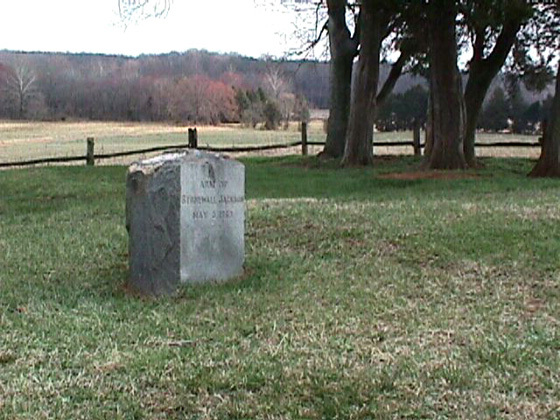 Jackson was wounded on the evening of May 2, 1863, along the Mountain Road, near the modern Chancellorsville Visitor Center (see Eric Mink’s very interesting series of posts about the location of that visitor center here). 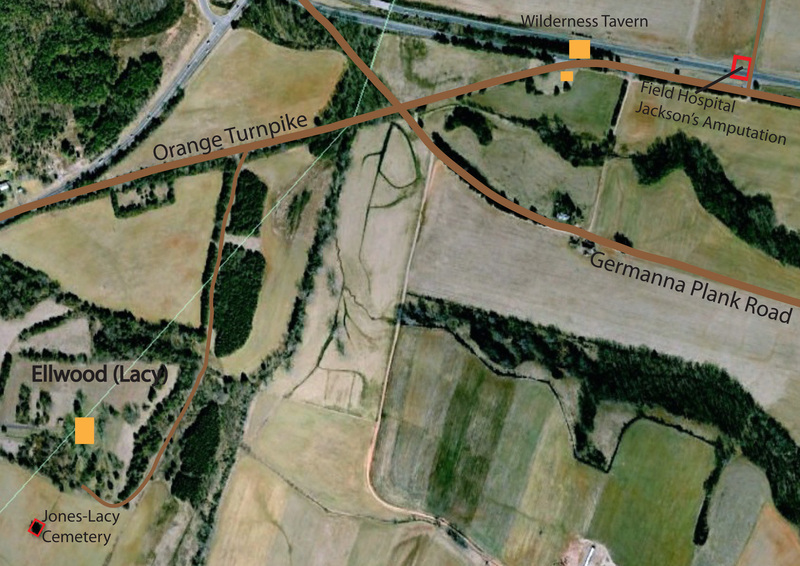 Put in an ambulance, he was transported back almost exactly 4 miles to a tented field hospital near Wilderness Tavern, along the Orange Turnpike (modern Route 3). There, famously, Dr. Hunter Holmes McGuire amputated Jackson’s left arm. The arm, according to Jackson’s chaplain Beverly Tucker Lacy, was “wrapped” and laid beside the doorway to the tent. The next morning Lacy found it there. The environs of Ellwood and Wilderness Tavern. Field hospital site at upper right, Jones-Lacy cemetery at lower left. The intersection of Routes 20 and 3 is just off the top edge of the image. Determined that the arm should have a proper burial, Lacy had access to a convenient spot. Rev. Lacy’s brother, J. Horace Lacy, owned nearby Ellwood, and so the reverend decided to take the arm there and bury it in the family cemetery. We know nothing of any ceremony that might have attended this, and he does not tell us where in the cemetery he buried it. We only know that he did. At about the same time, two other Confederate officers killed at Chancellorsville were buried in the Jones-Lacy Cemetery– Captain James Keith Boswell, killed in the same volley that caused Jackson’s mortal wound, and Major Joshua Stover of the 10th Virginia.